Second marriages and engagements bring great joy and overwhelming emotions. Like a first engagement, a ring should represent the couple and their future together. Many couples marrying for a second time opt for understated engagement rings or use the engagement ring as both an engagement and wedding ring. There are no set rules, however, and the couple should feel free to choose a ring that represents their love and their individual tastes. For women, though, there is one piece of etiquette that should be followed. Don’t continue to wear a former engagement ring once the new engagement has been sealed. Getting engaged and journeying into a second marriage also is the ideal time to re-evaluate personal tastes. Perhaps a diamond solitaire seems too conservative, or maybe a larger diamond seems more appropriate now that you may be more settled in life and career. While many couples plan their engagement together when embarking on another journey to the altar, some brides and grooms might still enjoy the surprise and romance of a traditional engagement. Planning a romantic and secret proposal still has the ability to sweep a woman off of her feet. If she never received a traditional proposal, then you have the opportunity to make this one extra memorable. When deciding to become engaged, discuss ring designs and choices. As time passes, so do trending styles. Her likes and dislikes can evolve along with fashion trends. Find a personal style and have the engagement ring serve as a reflection of that style. Now is a perfect time to go bold, go big and get unique with engagement ring designs. Some second-time brides find their new engagement as a time to embrace colored gemstones. For true gemstone elegance, you could even select a ring made completely of colored stones, leaving out the more traditional diamond center stone. 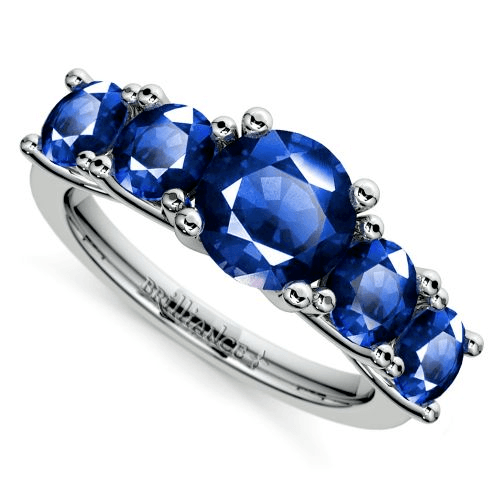 The trellis five sapphire ring features 1.25 carats of sapphires all stunningly set in platinum or gold. This dramatic design also may be set with five velvety rubies or five rich emeralds. Gemstones also may be chosen as a unique center stone. A 4.5 carat amethyst makes a bold and dramatic statement when surrounded by an exquisite halo of diamonds set in gold. When selecting a gemstone as a ring’s center stone, opt for larger carat weights. Most gemstone prices are much lower per carat than diamonds. 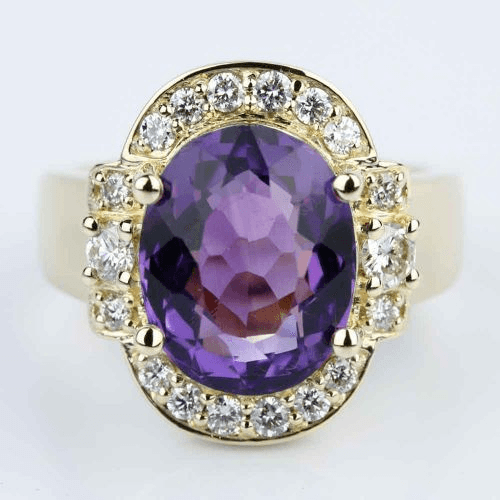 As a semi-precious stone, amethyst costs around $100 per carat. Choose a diamond ring that can stand alone when opting against having a wedding band as well. Halo diamond engagement rings boast exquisite sparkle and make a statement without needing the accompaniment of a wedding band. The three-stone halo milgrain split shank ring features a 2.01 carat center stone surrounded by dozens of smaller diamonds. 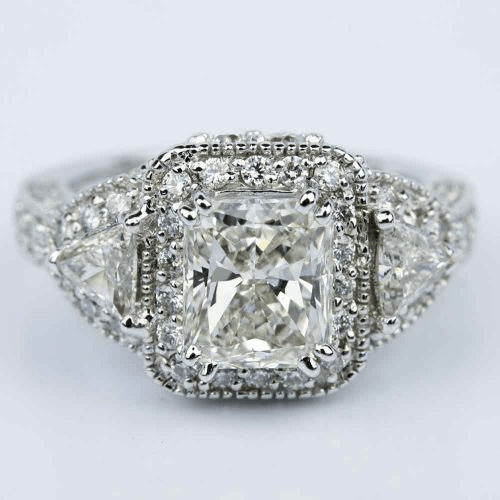 Use a square-cut center stone for a dramatic and vintage appeal. 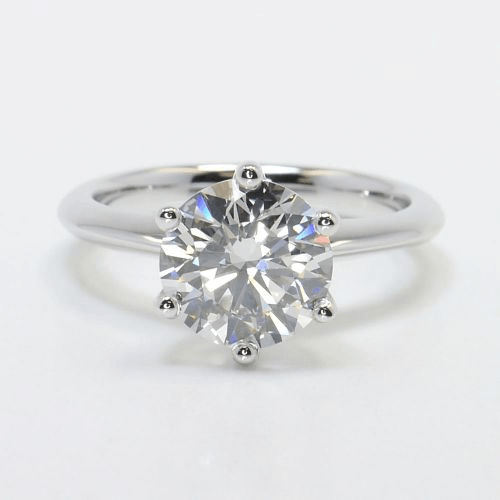 Elongated diamond shapes can be set horizontally to create a unique focal point for a ring design that defies traditional engagement ring builds. 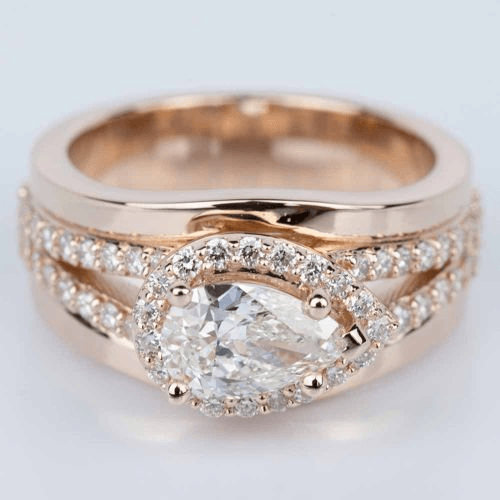 Rose gold sets the stage behind a nearly one-carat pear-shaped diamond set horizontally in this halo design. A pavé halo of white diamonds surround the center stone, and the split-shank setting hosts many more brilliant diamonds. This one-of-a-kind ring will ensure that all eyes fall on the left hand. Sometimes, second-time brides and grooms opt for the traditional if their first marriage was more outside the box. For these couples, a dazzling diamond solitaire in gold or platinum might be the best option. The popular round brilliant remains the most traditional diamond shape or you can add some personal style by selecting a unique diamond shape that elicits a more subtle statement—like an Asscher or emerald cut. Planning a second engagement and wedding is an exciting time for couples looking to begin a new life together. This second time around provides a new chance in life to express individual style and the love you share as a couple. Choose traditional ring designs or shun the traditional and explore new styles and gemstones. The ring—like the couple—is unique and should be celebrated with stunning Brilliance.